Jumpers and Mary’s Maids and Sherlock, oh my! This is a bit of a “catching up” post since I am going to try to cover a few different topics about last week’s Sherlock, “The Sign of Three,” before discussing (briefly) the latest episode, “His Last Vow” in a later post. 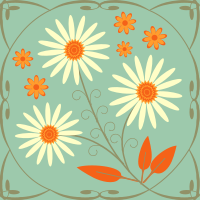 I have also realized that, in my Sherlockian zeal, I have allowed the entire month of January to pass without announcing my knitting and stitching goals for the year or explaining the enigmatic “2014 Smalls SAL” banner in the sidebar. Yikes. First, in my last post on the Sherlock episode, “The Sign of Three,” I neglected to mention Annie Modesitt’s latest colorway devoted to this episode. Called “Mary’s Maids,” the colorway is based on the dresses Mary (and Sherlock — I love how they bonded over wedding arrangements) chose for her bridesmaids. The dresses are your typically unfortunate, ill-fitting bridesmaid’s fare, but the colorway is a gorgeous “celebration of purple (sorry, Lilac) in subtle, semi-solid beauty” and you can view it in all its splendor (sorry, splendour) here. And while lilac bridesmaids’ dresses are an abomination unto the Lord, Annie Modesitt has managed to make all the shades of purple (one of my favorite colors) work together. Second, inspired by my favorite quote from Sherlock’s best man speech — “I could go on all night about the depth and complexity of his [Watson’s] jumpers” — I realized this would be a good opportunity to showcase some of my favorite patterns for men’s sweaters (or “jumpers”). I can’t guarantee they would all be favorites of John Watson, but I could see him looking bemused yet fiercely loyal in some of them. 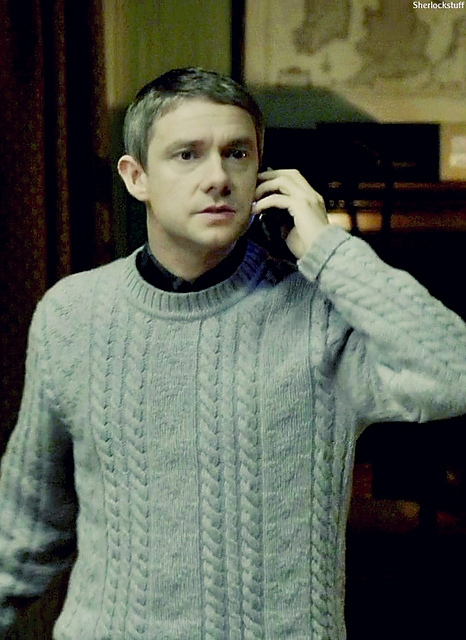 John Watson’s Jumpers have two Facebook pages, a Tumblr, and their own fan fiction page. I’m not kidding. I promise that my next post will have actual knitting and stitching content. Time to set some goals! Til then, the game’s on! *I’m going to avoid showing all the pictures of these beautiful sweaters, partly out of respect for copyright and partly so as not to clutter up this entry with pictures. So enjoy a little “action shot” of Martin Freeman, as John Hamish Watson, wearing a jumper. Pattern available on Ravelry, of course. Next Post Happy National Sweater Day!